Funmi’s excitement knew no bounds when she gave birth to a baby after 10 years of tortuous experience of childlessness. 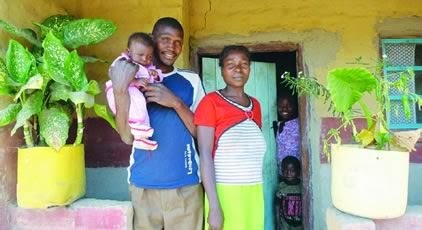 The obviously elated new mother and her heartthrob christened their new baby girl – Ayomide, meaning, ‘my joy has come.’ But, their happiness was punctuated when the baby began to show symptoms of cold and was diagnosed of pneumonia few days after birth. Funmi’s joy of motherhood became short-lived as Ayomide later tested positive to HIV and died before nine months. Ayomide is simply an example of the plight of millions of HIV- positive children with pneumonia. HIV-positive children are six times more probable to die from pneumonia than children not infected with the virus in developing countries. This was confirmed in the first worldwide study on the negative impact of pneumonia in HIV-positive children entitled: “Global, regional, and national estimates of pneumonia burden in HIV-infected children in 2010: A meta-analysis and modelling study,” published in The Lancet Infectious Diseases. Human immunodeficiency (HIV) the virus that causes acquired immune deficiency syndrome (AIDS) affects more than 34 million individuals globally. HIV/AIDS has been the cause of death of an estimated 30 million people. Globally, there are 3.2 million children below 14 years of age who have tested positive for HIV, 90 per cent of which live in sub-Saharan Africa. There is growing worry among experts over the high incidence of pneumonia among HIV-positive children. According to them, of the approximately 2.1 million children who are infected with HIV type 1 (HIV-1), more than 80 per cent will develop a respiratory illness sometime during the course of their disease. The prevalence of HIV-1 infection among African children admitted for very severe pneumonia under the World Health Organisation’s (WHO) case definition varies from 55 per cent to 65 per cent. The fatality rate was between 20 and 34 per cent that is three to six times higher than children who are not infected with HIV. In infancy, pneumonia caused by Pneumocystis jiroveci is often the first indicator of HIV/AIDS that prompts the test and consequently, early antiretroviral treatment for those infected. Statistics shows that approximately two million children less than five years die of pneumonia yearly, in countries with a high prevalence of HIV. Experts have stressed the need for the implementation of preventive strategies in reducing pneumonia-related morbidity and mortality among HIV-infected children, adding that it will be a big intervention. Studies have also shown that routine immunizations against Streptococcus pneumoniae, Haemophilus influenzae and varicella are safe and effective in HIV-infected children. Similarly, in 2013, WHO and the United Nation Children’s Fund (UNICEF) launched the integrated Global Action Plan for Pneumonia and Diarrhoea (GAPPD) to fight the diseases. The GAPPD calls for the use of proven interventions, including vaccination against measles, pertussis, pneumococcus, and Hib; exclusive breastfeeding in the first six months of life; and improved case management in communities. Other preventive strategies require urgent scaling-up, they added, insisting that these portend immediate hope for helping children. Instances are: Provision of co-trimoxazole prophylaxis against bacterial and P. jiroveci infections. Others are improvement in the provision of prevention of mother-to-child transmission (PMTCT) interventions and early use of Highly Active Antiretroviral Therapy (HAART). Studies in South Africa demonstrated that antiretroviral therapy benefits children below two years who are infected with HIV. This strategy reduced the infection in 42 per cent pneumococcal pneumonia, which can affect the upper respiratory tract and proliferate to the blood, lungs, middle ear or nervous system. Researchers have called for the implementation of early testing for HIV in infants; antiretroviral therapy (ART) for pregnant women and young children, and vaccination could significantly decrease child death due to pneumonia. “Pneumonia management in HIV infected children requires an integrated approach from national governments and international agencies” said Dr Harish Nair, a child health epidemiologist, in a press release recently. “Pneumonia and HIV case diagnosis needs to be strengthened at primary care level and antiretroviral therapy scaled up rapidly in pregnant women and young children” he added. Revised guidelines by the World Health Organisation for childhood pneumonia management must be fully implemented if substantial falls in pneumonia morbidity and mortality are to be achieved in badly affected countries.” concluded Dr. Nair. As part of efforts to actualise the objectives of the campaign against HIV and AIDS, stakeholders in Nigeria recently, examined strategic plans aimed at reducing new HIV infections via Prevention of Mother-to-Child Transmission of HIV (PMTCT) strategies. Dr Abiola Davies, a UNICEF HIV Specialist, said that Nigeria accounted for one third of new HIV cases among children in the world. Davies said: “Nigeria is among countries with slow mother-to-child transmission decline. This is responsible for the country accounting for one third of the new HIV infections among children worldwide.’’ The UNICEF HIV specialist said that infant infection rate in Nigeria had not changed much since 2009, insisting that the country must improve on its coordination of HIV and AIDS programmes, particularly at the state level. She, however, called for the decentralisation of PMTCT services and the empowering of the Primary Health Centres (PHCs) to carry out such services. Also, Davies advocated for increased involvement of the organised private sector and private health facilities in the fight against HIV and AIDS. She attributed some of the challenges facing PMTCT programmes to lack of access to PHCs by pregnant women and the paucity of health workers. Prof. John Idoko, the Director-General National Agency for the Control of AIDS (NACA), however, identified inadequate funding, poor coordination and lack of supervision as the major challenges facing efforts to eliminate mother-to-child HIV transmission (eMTCT). Idoko said that the eMTCT programme was aimed at eliminating the transmission of HIV from mother to child during the pregnancy, childbirth and breastfeeding stages. He recalled that in 2001, the focus of the eMTCT programme was on the PMTCT, adding that the programme was then implemented in a few tertiary health institutions across the country. “Poor monitoring and evaluation of eMTCT services, poor government supervision, lack of integration of HIV care in reproductive health services and poor infant feeding counselling services also hamper the exercise,’’ the NACA boss said. He also said that there was no early infant diagnosis in children hospitals and eMTCT centres because of inadequate funding and weak health systems. Idoko stressed that estimated number of infants exposed to HIV via mother-to-child transmission annually stood at 85,450, while the estimated number of HIV-positive infants without intervention each year was between 67,620 and 121, 716. Also speaking, Mr. Sola Ogundipe, the National Coordinator of Journalists Alliance for Prevention of Mother-To-Child Transmission of HIV in Nigeria (JAPiN), an NGO, said that the group would strengthen efforts to articulate a sustainable PMTCT policy for Nigeria via advocacy. Ogundipe underscored the need to sustain existing HIV programmes and urged the media to disseminate more human angle stories on how to prevent new infections in children. The JAPiN National Coordinator said that the group would explore new frontiers of effective communication as a crucial component of the national response to the growing challenges facing mother-to-child HIV transmission. Ogundipe pledged the readiness of JAPiN to partner with organisations interested in promoting effective and sustainable PMTCT policy and legislation in Nigeria. Concerning the campaign against HIV and AIDS, Mr. Geoffrey Njoku (UNICEF) Communication Specialist, said that the organisation had concluded plans to disseminate messages on HIV through video streaming for long distance travellers. Njoku said that UNICEF would collaborate with journalists in efforts to carry out the PMTCT campaign. The Communication Specialists said that a movie titled ‘Born Free’ had been produced as a public awareness tool on PMTCT to ensure effective communication, particularly at the grassroots. “This film would be disseminated through various platforms to reach a large audience with especial focus on the 12+1 states. “We will make use of mass transportation companies that move large numbers of passengers across the country every day, including women and girls of child-bearing age. “Some of the vehicles are equipped with audio visual facilities for airing movies,” Njoku added. He said that the video would also be shown at community viewing centres and cinema halls where people watched football matches, adding that the film would also be viewed at places such as restaurants, drinking joints and recreation parks. Industry watchers, however, agree that the adoption of pragmatic disease-prevention strategies will aid efforts to achieve zero new MTCT HIV infections in the country. According to them, this will significantly reduce child death due to pneumonia. Watchers of the scene insist that the success of reduction in infant HIV and AIDS, pneumonia and deaths will depend on the structured implementation of well-articulated MTCT HIV prevention and management programmes across the country. This story was published in Newswatch Times on February 12, 2015.